How healthy is the hotel market right now? Hotel room revenue is continuing to climb, reaching half a trillion dollars worldwide. Hotels represent nearly 40% of the global travel market. And room revenue is growing at healthy mid to high single digits, which is a bit faster than the travel market as a whole. And this analysis doesn’t even include private accommodation, which would add another $32 billion to the U.S. market alone. What makes the Asia hotel market stand out? Asia has one of the fastest growing hotel markets in 2016, second only to the ME, and is growing at 7-9% over the next four years. New properties are being added every week, investment in Asia is high. Carlson Rezidor, for example, is betting big on India. With 43 hotels under development, its goal is to double the presence in India by 2020 (add 60 more hotels in India by 2020). Online is soaring, especially in Asia, and growing at annual rates of 12-15% through 2020. As a matter of fact, online is growing at twice the rate or more than the hotel market as a whole. What’s driving online growth? Mobile? It’s not all because of mobile – let’s put mobile bookings in perspective. Mobile hotel bookings are still small but growing. It’s mostly desktop. China is an anomaly. More travel is booked on mobile devices in China than anywhere in the world. Half of all online travel is booked on mobile devices in China. But beyond China mobile penetration falls – with 80% of travel still booked on laptops/desktops in India and 70% in Japan. Here’s another way to look at it. This is based on recent research we did on Southeast Asia travellers. In Indonesia 60% booked their hotel through a mobile device, much higher than the other SE Asia markets which are still dominated by desktop/laptop. Besides mobile, the biggest reason why online is soaring is the rise of OTAs. So who’s winning the online battle? OTAs for lots of reasons. Preference by millennials, multi-product offerings, price perception and marketing spend. We can let the numbers speak for themselves. In nearly all regions OTAs beat out hotels in online booking. It’s 70/30 in Asia. The U.S. is the only market where OTAs do not dominate online hotel bookings – and it’s pretty even there. Because of the rise of Airbnb and HomeAway hotels are losing their edge in the U.S. as well. Remember that chart I showed earlier? Now look at OTA hotel growth in Asia. So OTAs are really driving the online hotel market right now. Probably a while, even though hotels are doing what they can to get customers to come direct, especially with loyalty member rates and so on. The fact is that OTA hotel success is all about the power of single bookings. What I mean by that, according to research we’ve conducted with Jumpshot, is hotels have twice the repeat booking rate at OTAs, reflecting the impact of loyalty programs and the importance of frequent bookers and business travelers to the hotel direct channel. Hotels are certainly better at retaining customers than OTAs. But the global online hotel market is not built on loyalty, it’s built on volume. Hotels need to turn that around. Hotels are not only battling the OTAs, but they must position themselves against a new types of accommodations. Private accommodations are now part of the decision-making process, guests are looking for a variety of accommodations, seeking shared spaces, more autonomy, more of a connection with the community. Our research shows it’s mostly budget and midscale properties at risk. And that makes sense since millennials now make up half of the U.S. renter population. What are hotels doing about it? Are they doing enough? Hotels are doing lots of things to shore up their position and ensure good growth ahead. For chains, it’s about gaining loyalty and adding members to their loyalty programs – and we are starting to see the results of that. For all hotels, it’s the constant drive to get guests to book direct. Chains are counting on member rates to get more people to book direct, but there is a lot of discussion if this tactic is working or not. Hotels needs to look at the total cost of acquisition – or they’re fighting the wrong battle. 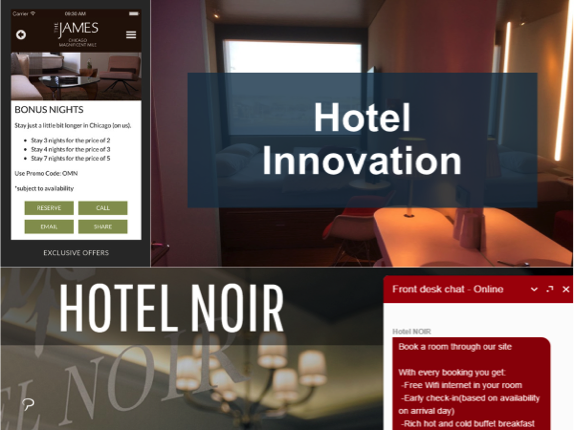 Hotels are investing in business intelligence and tech to gain the upper hand with guests. This includes everything from knowing your guest preferences and being able to make recommendations or setting the room just the way they like it, so using messaging apps for guest services. There’s a ton of stuff and look no further than our own Hotel ICON which is cutting edge here. Airbnb is in the business of selling activities, and launched Trips late last year, and they just recently launched Trips in Taiwan (there’s Google Trips etc.) so hotels need to up their game from the concierge desk to new businesses. This can be done through the mobile website or hotel app. In Asia, we found that about 1/3 of Thai and Indonesian travelers booked day trips/tours on mobile. The hotel that can use data and technology to differentiate won’t have to worry about OTAs or Airbnb? Guests are telling us these are the things they want…. Hotels need to find a way to add local content to their websites/apps. People will still book on their preferred channel no matter what, and infrequent travelers won’t worry about loyalty. But guests will remember their experiences and they travel more, they will gain an affinity to brands. The key is how well they can use data to personalize the experience. Guests tell us they are interested in preference based recommendations, especially for local restaurants, sightseeing, tours and attractions. Once guests see the value in the relationship, they’re bound to return. Newer PostOTA Billboard Effect Is Still Strong!